I don't see a way to hide "Student Requirements cont." in the Table of Contents. It's annoying to see this when it's on the slide in any case. I previously used Lectora Snap! and there was a checkbox to hide the slide title. I achieve this by hiding the slide and then manually setting the branching to the next slide. 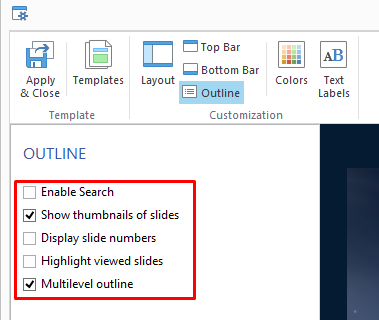 So the only thing hidden is the slide title in the outline. On a big presentation, this takes some time, so I'm pleased to see this! Thank you for your attention to this topic! But, I don't want some slides to appear full-screen and others with the Table of contents. This makes the presentation very "jumpy." 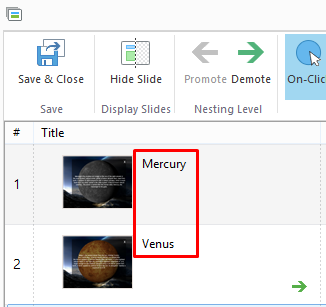 My goal is to have a single title appear in the Table of Contents whether it covers one slide or multiple slides. If a simple program like Snap can do this, why can't you? Not sure what exactly you are trying to do. Could you please show on a screenshot what should the table of contents look like? Here is an example of a published presentation with 4 slides. If you need any assistance with your creative process, please do not hesitate to send us a message to support@ispringsolutions.com.